Juan Cruz Mallia curls the ball too far, missing the posts to the left. Jaguares are only a few metres out, surely they must score! And they do with Matias Orlando touching down. Juan Cruz Mallia can consider himself unlucky as he sees the ball hit the left upright and bounce away. Jaguares sub Santiago Carreras comes onto the field. Joaquin Tuculet departs for Jaguares. Rodrigo Bruni comes on for Jaguares. Pablo Matera leaves the field. Fabulous play by Sharks has led to Jacobus Van Wyk being able to wriggle through a gap. Juan Cruz Mallia comes on. Sharks have won 100 rucks so far this game. The Jaguares supporters go wild as Domingo Miotti successfully kicks the conversion. Domingo Miotti sets up the try. Slick passing by Jaguares leads to a try for Matias Orlando. Trouble here as Matias Orlando breaches the defence. Matias Orlando has made 10 good tackles so far this game. Domingo Miotti makes no mistake with that penalty goal attempt. 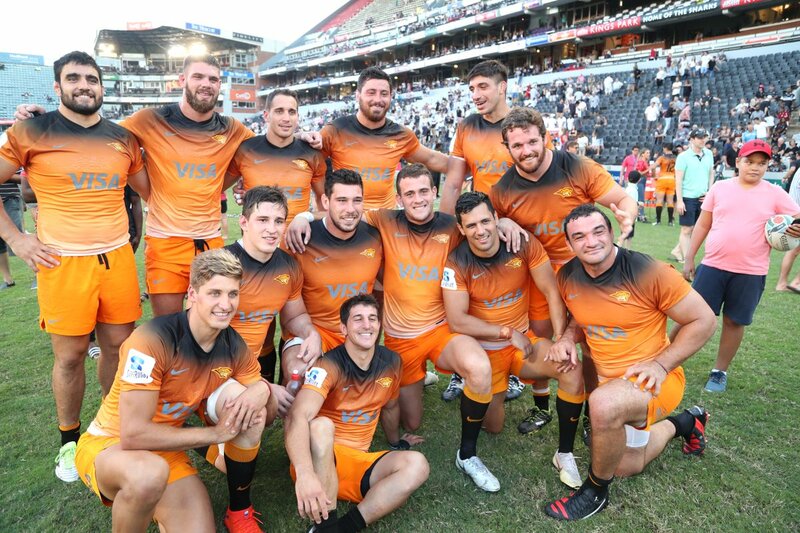 Jaguares have a drop goal attempt, but its pushed to the right. Santiago Medrano has made 10 good tackles so far this game. The touch judges raise their flags as Curwin Bosch kicks the conversion. This is dangerous for the defence as Aphelele Fassi bursts through to advance the Sharks attack. Curwin Bosch sets up the try. Incisive passing by Sharks is finished off by Aphelele Fassi, as he goes over for the try. Sharks have won 80 rucks so far this game. Guido Petti Pagadizaval has made 10 good tackles so far this game. Sharks decide to make a substitution, with JJ van der Mescht getting some game time. Sharks decide to make a substitution, with Ruben van Heerden being replaced. Tomas Lezana has made 10 good tackles so far this game. Domingo Miotti has hooked the conversion to the left of the posts. A gap opened in the defence and Matias Moroni took full advantage. Sharks make a substitution with Lwazi Mvovo coming on. Sharks make a substitution with Robert du Preez coming off. Sharks sub Fezokuhle Mbatha comes onto the field. Kerron van Vuuren departs for Sharks. John-Hubert Meyer comes on for Sharks. Thomas du Toit leaves the field. Jean-Luc du Preez comes on. Phillip Van Der Walt comes off. A bit of individual brilliance by Matias Moroni leads to a try for Jaguares. Jaguares decide to make a substitution, with Javier Ortega Desio getting some game time. Jaguares decide to make a substitution, with Tomas Lavanini being replaced. Jaguares make a substitution with Mayco Vivas coming on. Jaguares make a substitution with Nahuel Tetaz Chaparro coming off. Jaguares sub Agustin Creevy comes onto the field. Julian Montoya departs for Jaguares. Domingo Miotti kicks the penalty. Marcos Kremer has made 10 good tackles so far this game. Jacobus Van Wyk comes on for Sharks. Lwazi Mvovo leaves the field. 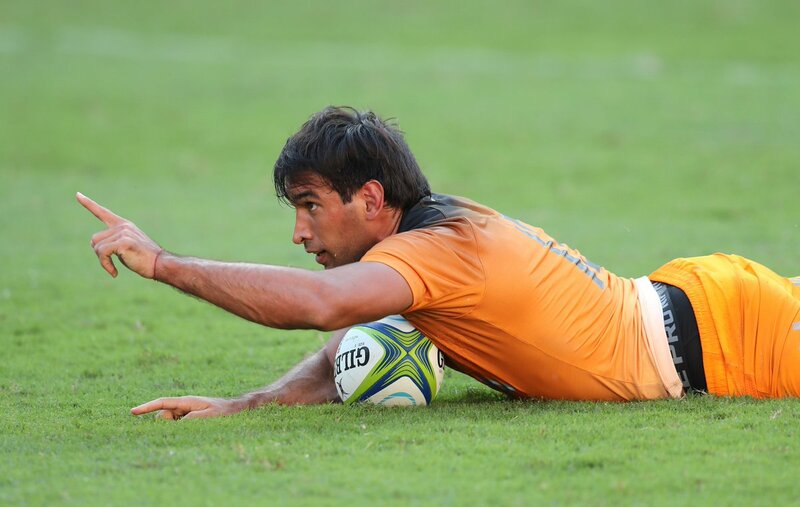 Domingo Miotti adds the two points for Jaguares. Spellbinding play by Emiliano Boffelli is finished off with a try. Silky skills by Jaguares ends with a try for Pablo Matera. The defensive line has been broken as Louis Schreuder goes through the gap. What a run here by Matias Moroni as they gets over the gainline!. Domingo Miotti does the business as his conversion attempt goes over. Emiliano Boffelli played a key part in that try. A wonderful passing move by Jaguares is finished off by Matias Orlando. Emiliano Boffelli makes the break as the defence re-enacts the parting of the red sea. Julian Montoya has made 10 good tackles so far this game. Domingo Miotti makes no mistake with that conversion attempt.  A stunning solo try from Pablo Matera. Fabulous play by Jaguares has led to Pablo Matera being able to wriggle through a gap. Jeronimo De La Fuente has made 10 good tackles so far this game. Trouble here as Curwin Bosch breaches the defence. Robert du Preez has kicked a penalty goal. This is dangerous for the defence as Makazole Mapimpi bursts through to advance the Sharks attack. Robert du Preez converts the try. That's a great try assist by Luke Stringer. A series of passes by Sharks results in a try for Hyron Andrews. A gap opened in the defence and Curwin Bosch took full advantage. Domingo Miotti has kicked a conversion. Tomas Lezana sets up the try. Great hands by Jaguares leads to a try for Tomas Cubelli. The defensive line has been broken as Tomas Lezana goes through the gap. Marcas positivas tras la gira por Sudáfrica. 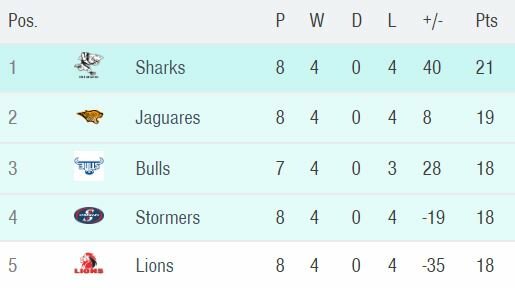 Así está la tabla tras la victoria frente a @TheSharksZA en Durban. Un gran presente para Jaguares que se vuelve invicto de Sudáfrica. It wasn't the result we wanted but thank you to all the fans that came out to support us. 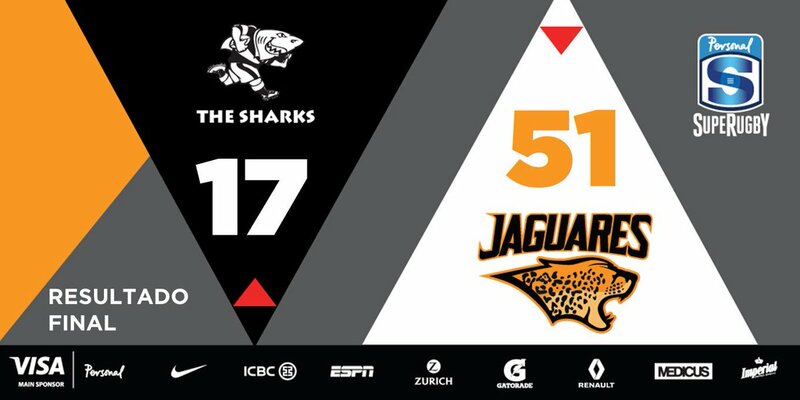 #OurSharks went down 51-17 against the @JaguaresARG this afternoon at JONSSON KINGS PARK. ¡¡¡¡ El tercero de @Tostao_M !!!!!!! Otro debut en @JaguaresARG con el ingresó Santiago Carreras. 67': Another soft try by the Jaguares sees another try in the backline. 64': Penalty awarded to #OurSharks at scrum time. They will have a lineout deep in the @JaguaresARG half. 63': Another penalty to the Jaguares at the breakdown. They kick into touch. Suma de a tres Miotti. 60': Penalty awarded to the Jaguares for offside. They opt for poles. Llega al try Fassi para los locales. @tutemoroni Segundo try para Tute en la temporada 2019.
y try de @tutemoroni !!!! 53': Plenty of changes to the @CellC Sharks team as the bench makes its way on to the field. Cambios: Creevy x Montoya, Vivas x Tetaz Chaparro y Ortega Desio x Lavanini. 49': A penalty is awarded to the Jaguares for an apparent late challenge. they kick for poles. 46': After 9 phases #OurSharks lose the ball forward in the backline. The Jaguares will have the put in. Conversión de Mingo y la diferencia que se estira a 18 puntos. ¡Gran arranque del segundo tiempo! Buena defensa de @JaguaresARG en el primer tiempo. Arrancó el segundo tiempo en Durban. 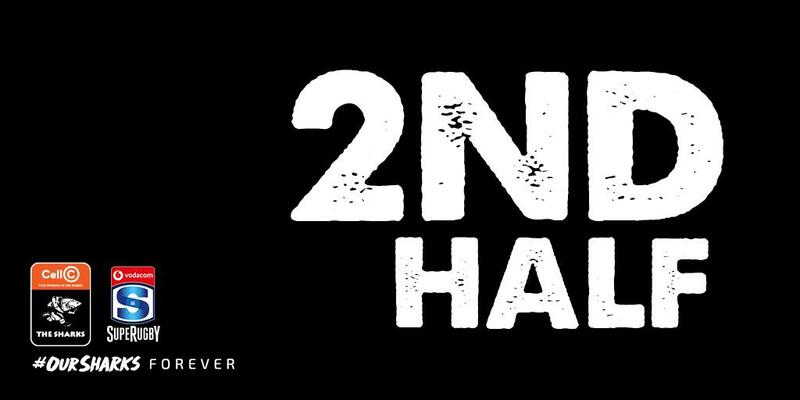 Follow all the action as the 2nd half gets underway at JONSSON KINGS PARK.